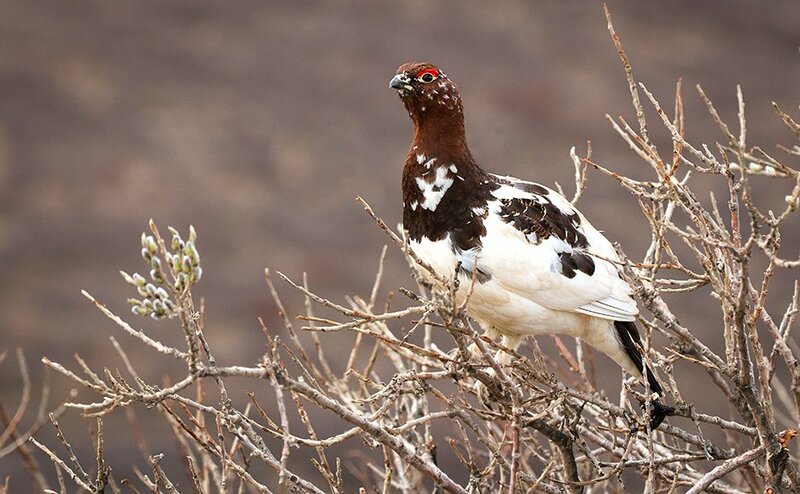 A male Willow Ptarmigan, Alaska's State Bird. This tour focused on birds and wildlife, from the rainforests of southeast Alaska to the snowy Alaska Range. We visited two national parks-- Glacier Bay and Denali-- and drove the entire Denali Highway. Our adventure began in Alaska’s state capital: Juneau. The weather was a bit drizzly and gray– which is often the case in southeast Alaska– as our group assembled. Once everyone had arrived, we sat down for a little meeting for introductions and an orientation. There was a little time to wander the area before dinner. Some perused the shops of downtown Juneau, while others walked the shore, looking for birds. We ended the day with a hearty dinner and good conversation over beers and wine. Getting up early, we headed to the ferry terminal north of Juneau. We were heading to the small town of Gustavus, at the mouth of Glacier Bay. With everyone aboard, the ferry got underway and we started to get a real feel for the scenery and maritime vibe of Southeast Alaska. After breakfast and coffee in the cafe, we all spent time out on deck, scanning the calm waters of the Inside Passage for seabirds and marine mammals. Among our first birds seen were Pigeon Guillemots and Common Loons. We also had a glimpse of a Minke Whale, which was a first for many of us. After a few hours, we arrived at the dock in Gustavus, where the staff of our guesthouse met us and transported us the short distance to our lodging. Gustavus is a pleasant, quiet community, reachable only by boat or airplane. It is surrounded on all sides by spectacular wilderness. We settled into our rooms, had a lovely lunch, then ventured out to explore nearby Bartlett Cove. This is the gateway to Glacier Bay National Park. We enjoyed a little free time to check out the visitor center, the trails, etc. A highlight for many of us was the intimate, moving presentation we got from a native Tlingit woman (who is also a ranger for the Park Service) in the beautiful Tribal House. We spent this entire day cruising up into Glacier Bay National Park, aboard the small ship that we chartered. What an experience! Glacier Bay National Park and the surrounding lands are a UNESCO World Heritage Site and make up one of the planet’s largest areas of international protected land. The weather was pleasant as we motored north to our first major stop and best birding site of the day: South Marble Island. This tiny island is a haul-out site for dozens of Steller Sea Lions as well as a nesting site for numerous bird species. 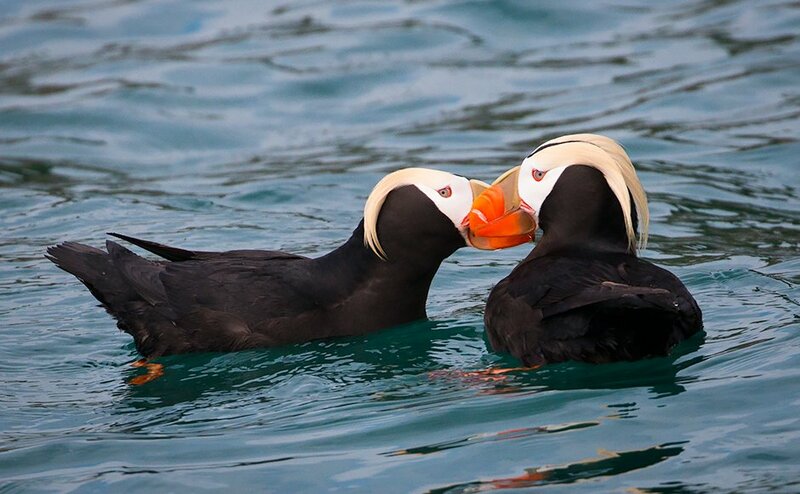 We got great looks at both Tufted and Horned Puffins here! There were many Black-legged Kittiwakes nesting on the cliffs and we also saw Black Oystercatchers, Common Murres, and Harlequin Ducks. A family of Bald Eagles was perched on the rocks above the birds nesting and foraging below. Further up the bay, we were thrilled to watch several Brown Bears walk along the shore. 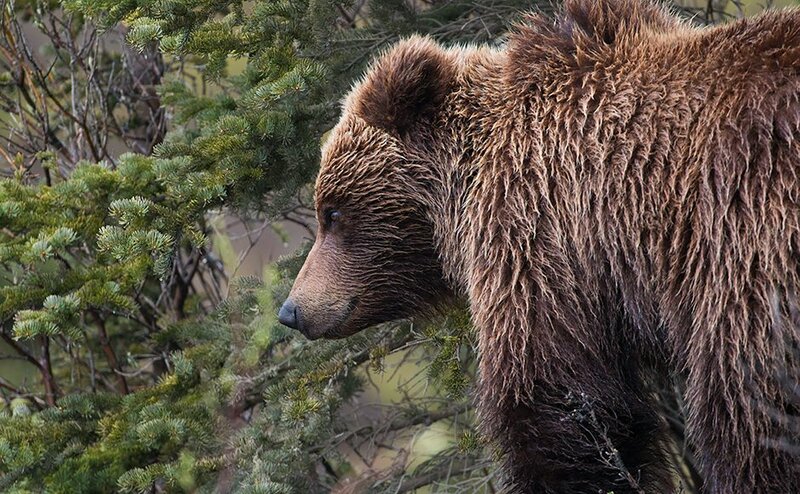 The local subspecies of Ursus arctos here is called the Brown Bear; another subspecies, the Grizzly, is found in the lower 48 and in interior Alaska. We believe we were witnessing a mother bear begin the process of driving her older cub away, to live on its own. Fascinating! Other mammals we got great looks at included Mountain Goats at Gloomy Knob and many Sea Otters. Finally, we arrived at our most remote site in the bay: Lamplugh Glacier. This massive river of ice flows down from the Brady Icefield in the Fairweather Range to the bay. The site of that great wall of blue-hued glacial ice was spectacular. The cold waters around our ship were thick with small icebergs. Among the pieces of floating ice, there were numerous Kittlitz’s Murrelets. Most of the world’s population of this species breeds in this very bay. We had already been seeing many Marbled Murrelets in the bay. We drank hot chocolate and took in the awe-inspiring scene before heading back the way we came. We enjoyed a pre-breakfast birding walk down to the shore from our guesthouse in Gustavus. We watched a Bald Eagle gathering nest material and got nice looks at Rufous Hummingbirds. We checked out, stopped at a charming coffee/gift shop in town, then took a pleasant walk along the Nagoonberry Loop trail, which passes through land owned by the Nature Conservancy. Varied Thrushes were singing in the Sitka Spruces around us and we got nice looks at Savannah and Fox sparrows in the meadows. To get back to Juneau, to catch our flight from there to Anchorage, we chartered two small planes for a scenic flight. We flew over the mountains and had wonderful views of the snow-clad peaks and even got to see some mountain goats on the slopes! We then got aboard our much larger plane to get to Anchorage. In the late afternoon after checking into our hotel a number of us visited Potter Marsh outside of Anchorage to do a little birding. It wasn’t very birdy at the time, perhaps due to the wind, but we got to see our first Moose in Alaska! We piled into our two rental vehicles this morning and hit the highway, heading north into the wilds of Alaska. We made several stops and forays along the Parks Highway. The first of these was Petersville Road. There we got good looks at Swainson’s Thrush and Orange-crowned Warbler. Next we spent some time at a viewpoint, admiring the highest mountain in North America: Denali (20,310 ft; formerly Mount McKinley). We were very lucky to have clear skies and a perfect view of the snow-clad mountain. Our next birding stop was Byers Lake. We took a short hike along the shore and got to see some interesting species. We had nice looks at a pair of Common Loons on the lake, but many of us were even more excited to see Long-tailed Ducks on the water! This was a ‘lifer’ species for many in the group. We also had a close-in Black-backed Woodpecker, though the view was difficult through the trees and not everyone got to see this species. We could hear Northern Waterthrush along the way, but had to wait for another day to get good views. A female Spruce Grouse gave us a wonderful show as she walked along the road near the lake. We continued north on the Parks Highway and had dinner at a quaint restaurant not far from the entrance to Denali National Park. After dinner, we made our way at last to our hotel. It was late, but the sun still shone brightly at this high latitude. Throughout our time in Alaska, we marveled at the long hours of daylight and how birds were still singing and active well past 10 PM! This was our big day venturing into the amazing Denali National Park. Because the road through the park is closed to private vehicles (for the most part), it’s necessary to ride one of the transit buses if you want to see the heart of the wilderness here. Everyone had a free day to enjoy the park on their own by getting off and on the bus, all the way to the Eielson Visitor Center. There was still lots of snow on the ground in places. Denali NP is one of the few places in America that offers such fantastic opportunities to see ‘charismatic megafauna’ in the wild. We saw numerous Grizzly Bears, Dall Sheep, Moose, and Caribou. Bird highlights included a Gyrfalcon and great looks at Alaska’s state bird, the Willow Ptarmigan. After our long day in the park, we enjoyed local beers and good food at the 49th State Brewery in Healy. After dinner, the sun was still shining and most of us went birding at a nearby lake. There were many species of waterfowl on the water and we were able to add a handful of species to our growing list. 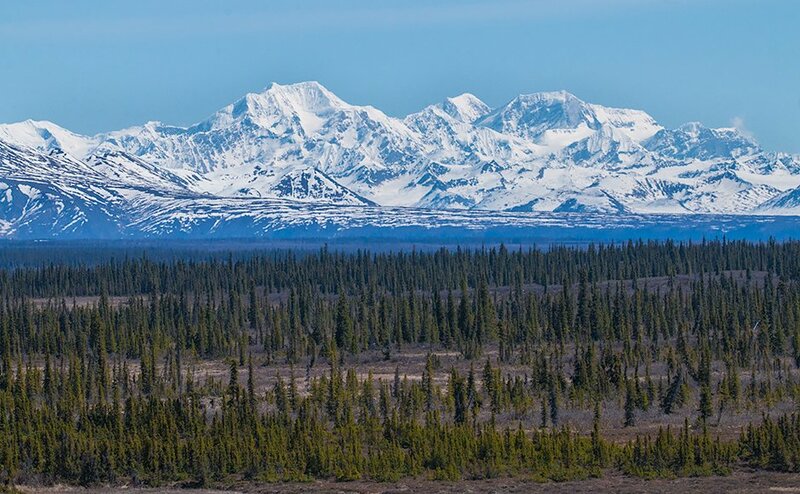 The 135-mile-long Denali Highway is one of the world’s most scenic byways. It is a well-graded gravel road that runs west to east through gorgeous wilderness. We spent the whole day driving most of the highway and it was spectacular. The sun was bright and the sky was brilliant blue and we progressed from one scenic stop after another. We added some great birds this day: Tundra Swan, Merlin, Boreal Chickadee, Northern Waterthrush, and Blackpoll Warbler. We also saw Porcupine, Moose, Caribou, Arctic Ground Squirrels, and Beavers. It was an amazing drive! We got up extra early this day, to make sure we got to the airport in Fairbanks on time. Gray-cheeked Thrushes were singing around us at our lodge and we got good looks at them. Common Redpolls made an appearance there as well. As we completed the last leg of the Denali Highway we got to see more beautiful scenery and had a great look at a Rough-legged Hawk, perched and in flight. We added a few last species that morning, including Bank Swallow and Yellow Warbler. The final stretch of our long journey gave us some more amazing Alaskan scenery as we came around to the north side of the Alaska Range. In Fairbanks, we said our farewells and ended this wonderful adventure.